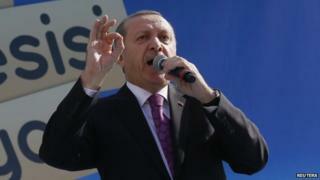 His latest remarks were delivered at a women's conference in Istanbul. "In the workplace, you cannot treat a man and a pregnant woman in the same way," Mr Erdogan said, according to the Anadolu news agency. Women cannot do all the work done by men, he added, because it was against their "delicate nature". "Our religion regards motherhood very highly," he said. "Feminists don't understand that, they reject motherhood." Mr Erdogan also told the Istanbul meeting that justice was the solution to most of the world's issues - including racism, anti-Semitism, and "women's problems". In his 11 years as prime minister, Mr Erdogan became a crucial player in regional politics. However, his reputation has suffered recently over the crisis in Syria, and accusations of authoritarianism.